Telestar asked me for being one of the speaker during the "Workshop day" on "Windows, IIoT and Real-Time". The Workshop will be in the SPS-IPC Drives Italia fair in Parma (Pad. 7) - FRAGOLA Room - from 10:30 to 16:30. Entry is FREE upon REGISTRATION (limited seats) REGISTER here. Here is the original Telestar poster with all the information. Telestar is delighted to invite you to the day of deep dive in technologies to put the PC and Windows more and more centered in the new automation-related architectures. BEPS Engineering, Microsoft, MIC and TTG invite you to take part to the "Iot Day" event. During this "IoT Day", that is "free of charge", you will discover the solutions proposed by Microsoft to exploit the potential of IoT easily, providing a complete and smart platform. In addition, during the workshop in the afternoon you will also have the opportunity to try the tool directly in hand on Lab. All the speakers: from Microsoft, MVP and from the TTG community, will be on hand to answer your questions. "The Microsoft Cloud Roadshow is a free, two-day technical training event for IT professionals and developers that provides best practices and insight directly from the experts who build and run the cloud services across Office 365, Azure and Windows 10. " It will be a fantastic event where I will be present in Ask The Expert Area on May, 23 from 4pm to 6pm. Whether you know your way around the cloud and trying to stay current or are just getting started and figuring out the best path forward - having access to best practices and training is more critical than ever. On Friday September 28th, inside the MIC (Microsoft Innovation Center) Labs, Microsoft will host a DEV CAMP, an event for developers like the ones organized in Milan and Rome. All these events are free, realized by local community developer support! They are a great opportunity to be in direct contact with Microsoft evangelist and technology experts (MVP, Trainer, etc. …). 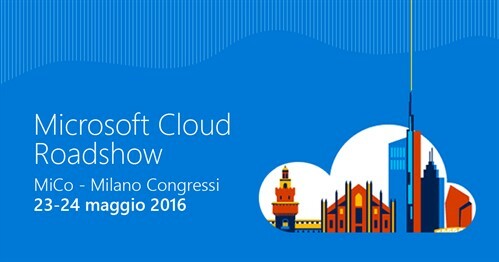 The Turin event will allow the attendees to choose among Windows Azure, Windows Phone and Windows 8 and it has been organized in collaboration with MIC and TTG - (Torino Technologies Group) a local developers community.